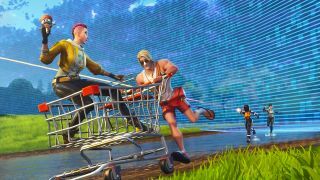 Since the early days of Fortnite, players have been clamouring for some detailed stats in-game about their performances and play style. Unfortunately, Epic are yet to provide us with the information we desire so the best way to find out your stats is to use a Fortnite tracker guide. Like this one! We've taken a look at the two best Fortnite trackers and delved in to find out how to use them most effectively. From your average kill/death ratio per game mode, to your highest ever kills total in your best match, these third-party Fortnite tracker sites are used by all of the top players around the world. This means you can compare your stats to players like Ninja and Tfue by linking directly to your Epic account. Here are the best Fortnite trackers as we finish Fortnite Season 7 and head into Fortnite Season 8. Tracker Network has a plethora of sites across multiplayer titles from Realm Royale and PUBG to Destiny 2 and The Division. This Fortnite tracker has a host of customisation options along with the option to pay a monthly subscription fee for their premium offerings. One of the main draws from Fortnite Tracker Network is their TRN Rating - their version of an ELO ranking. Everyone starts at 1,200 then according to their official post, the “best players” will be found at the 5,000 mark. You can look at your stats per season for each mode and see if you’re improving or declining with various trends and graphs. As long as you have your profile open while you’re playing, the site will also track individual matches and record them in your match history. This means that if you have it open for every game you play, it will accurately record all of your bests such as highest kill games and longest win streaks. On top of all that, they offer community challenges for cash prizes such as most duo kills in a specific timeframe, along with detailed stats on all the weapons in the game and a number of leaderboards to see who the best in the world is and how you stack up against them. If you’re looking for teammates, you can visit the LFG section to find players in your region and on the same platform to partner up with, too. Storm Shield offers a lot of the same stats you see on Fortnite Tracker Network but for Battle Royale, it’s not quite as detailed. Save The World is where Storm Shield shines: everything from missions to storms and schematics are available to the finest detail. Interested in the next mission at Plankerton? Storm Shield will tell you exactly what the mission details are, how long is left on it, the rewards you’ll earn and more. Looking up your individual profile tells you the level of all your unlocked heroes, your gadgets, total progress across each area, how many gnomes you’ve destroyed… it’s by far the most comprehensive look at everything to do with Fortnite Save The World. You can even look at all your personal schematics to see the individual stats and compare them with everything else you’ve got. Storm Shield’s Battle Royale tracker is great and the layout is the most user friendly of the three trackers we’ve listed, but it doesn’t provide anything unique. They’ve got a great detailed look at the in-game store though, providing images of all the leaked cosmetics, information about when an item was last seen in the store, what will likely show up again soon and more. These are the two Fortnite tracker sites available - there are others such as Fortnite Stats and Fortnite Scout, but both don’t offer anything unique and tend to be out of date in regards to their item databases and news posts. Ultimately though, it’s down to personal preference. These are the two we’d recommend but the basic stats on any third-party site are better than the ones found in-game so take your pick.